Wednesday lunch on our weekly menu is usually leftovers. But this week our fridge was oddly bare so I had to do some fast thinking for what Max and Elly could eat for lunch. In addition, they had cut their nap short, so lunch prep needed to be participatory. So I reached deep into the recesses of my mind to recall a Pinterest post I had once seen involving hot dogs and spaghetti, both of which we had stocked in our kitchen. Enter: hot dog surprise (although here we actually refer to beef franks as sausages and eat them for breakfast). I told Max and Elly we were making a surprise for lunch and got them started on inserting uncooked spaghetti noodles through chunks of hot dogs. A bonus fine motor skills development activity! And it kept them entertained for a while. Double score! 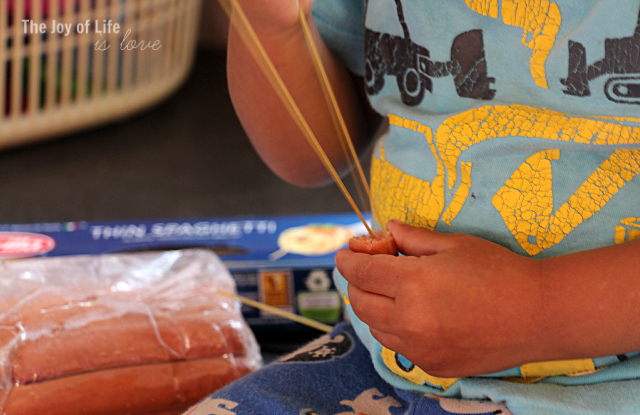 Max and Elly went out to play and I boiled the spaghetti-skewered hot dog pieces. And voila! Lunch was ready. In hindsight, photographing these hot dog pieces up close on a pink plate makes them seem really unappealing. But Max and Elly ate ’em up. Elly liked hers with a little (okay, a lot) of parmesan cheese sprinkled on top. Thanks, Pinterest. You saved lunch. No, Brenda – YOU saved lunch. Not Pinterest.